I forgot to include in my Saturday Long Run post that I bled all over two pair of shoes. After about two miles, I noticed that my middle toe on my right foot was hurting. The pain was coming from the next toe (well the toe nail). I tried to re adjust my foot, but the pain was still there. I changed shoes and socks after my running group finished their run and didn't notice that my foot was bleeding. 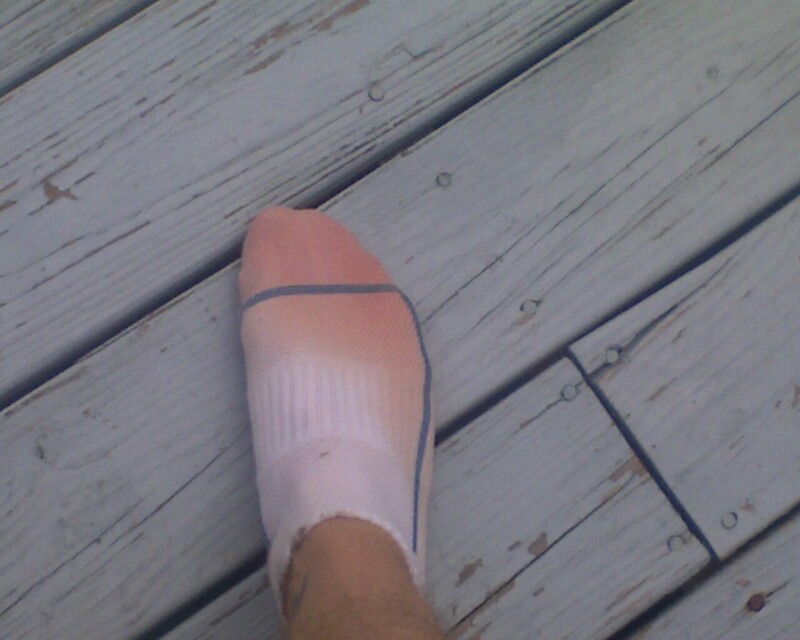 When I finished my last eight miles I looked down and saw the blood all over my right shoe! When I got home and put both pair of shoes on the porch to dry I saw that both right foot shoes were bloody. I checked out my foot, but only found a small cut. How does that much blood come from such a small cut? Anyway, I cleaned up my shoes and put a band aid on my toe and went on with my day. Yesterday, I ran the bridge and noticed that my band aid had fallen off and the pain was back. I couldn't believe it, my foot was bleeding again! I cleaned it up and put a band aid back on and it seemed fine during my next two runs. That's nuts. I've bled all over shirts before, and even had a tiny speck of a cut that got through my undershirt and all over my shirt during my marathon, but not my shoe before. That's pretty cool looking actually. I don't mind bleeding from anywhere during a run except for the feet. Most of the time, it's fun to run with a bloody knee or scratched up shins from the trail. Didn't seem like it was painful though, just messy, huh? Oh well, take care of them dogs, man.